Filter out any kind of bad language. The WordFilter plugin gives your community peace of mind. 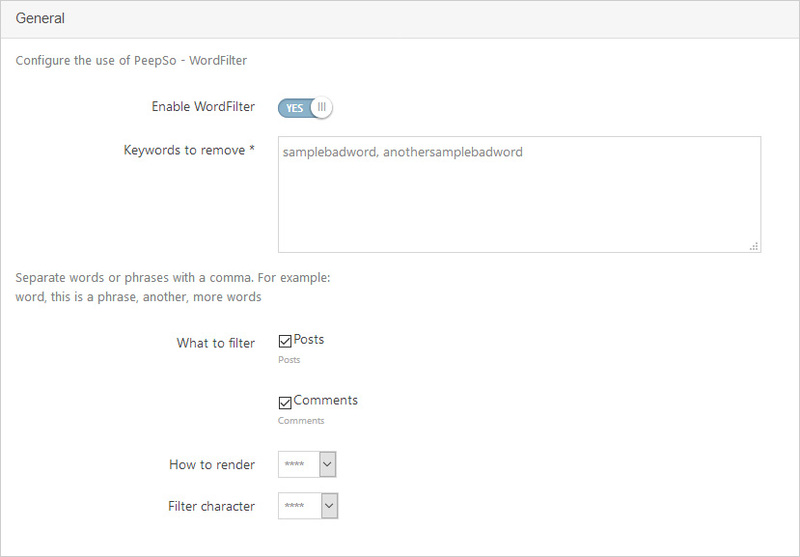 Whether your community has a young audience or whether you just don’t want to show any profanity in your community’s posts or comments, the PeepSo – WordFilter plugin keeps your content family-friendly. Decide which words and phrases to filter out. Decide whether to apply censorship on Status Updates. Decide how you want the censored words to look like. Decide whether to apply censorship on Comments. When Chat plugin is installed and WordFilter enabled unwanted words and phrases are removed from chat conversations automatically.